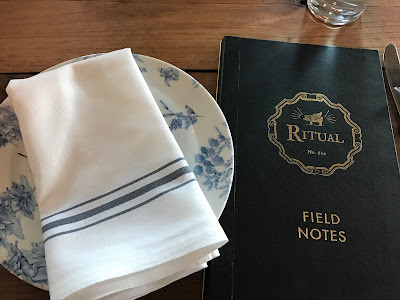 Happenstance that brought me to Ritual, been meaning to give them a try. I've heard a lot about their burger, but was very curious about their steak. But first, let's get a glass of wine. 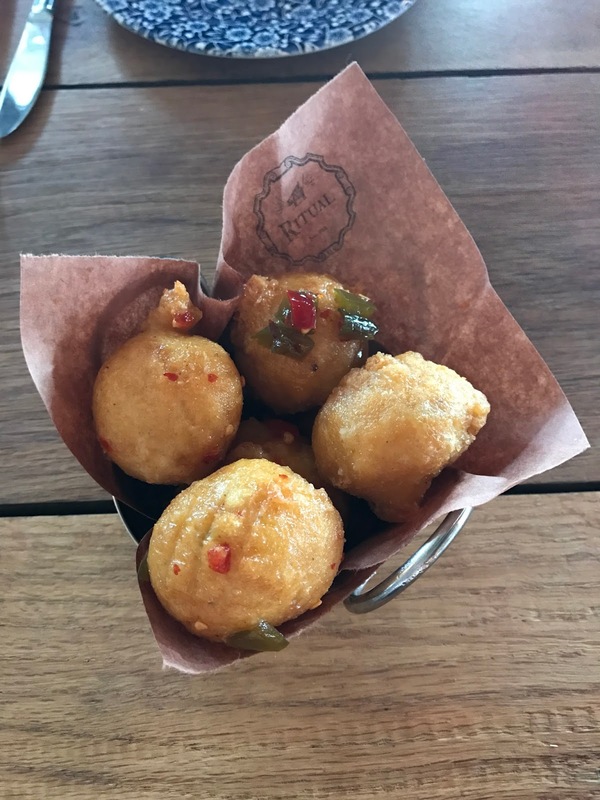 Per our server's recommendation, we got the hush puppies, but this is like no other hush puppy I've ever had. First off, this is made with sourdough, and then it has this jalapeño sauce that combined with it is more like a sweet and sour sauce. So, you soak some of that sauce and the hush puppy is not super fried, it was actually pretty good. I was surprised. This is the after photo. 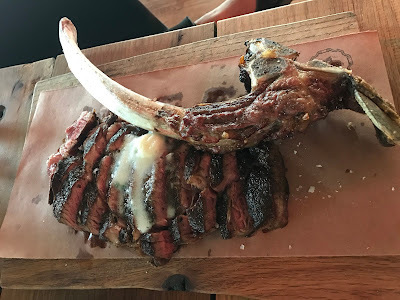 You really want to take the bone home as a souvenir and show off to your friend that you ate that. Don't worry, we split it so I didn't hoard it all. That said, per butcher and chef's recommendation, they cooked it medium and it was not chewy at all, and delightfully delicious. Because they cut it for you, you don't realize you're consuming all that steak, especially when that was not super filling until you're done eating. And you need some veggies, right? We got the seasonal veggie which was grilled brussels sprouts with bacon and walnuts. If they have this growing up, I'd eat more brussels sprouts. To end the meal, which we did save some room for dessert, we got the apple oatmeal pie. It has vanilla ice cream ala mode with caramel sauce on top. Totally awesome, and not too over the top. Perfect end of the evening. I thoroughly enjoyed that meal. Basically, we have an awesome server who guided us with the entire order. He would tell us what the butler has on top shelf (just like alcohol, the good stuff), and while it is off menu and you pay a bit more, it's definitely worth its weight on quality. They also are so well verse that you can tell them your preference and they can make the appropriate pairing or recommendation. We just loved the experience so much. Definitely go back. We lucked out as we just walked in, but for a prime time dinner time, reservation is highly recommended.